Just like beauty is in the eye of the beholder, so is music to the ear of a listener. In its thirteen two-concert seasons, the 58-member Diverse Harmony chorus has performed music that has opened the hearts and minds of communities while providing a safe environment for queer youth while they share their love of music and are accepted for who they are. Diverse Harmony consists of two separate groups. The large chorus, which consists of youth ages 13-22, where everyone is accepted whether you can sing or not, has rolling admissions, so youth can go to any of the weekly rehearsals that they wish. Enrollment is free and their season starts up again on September 15. The second group, Diverse Harmony Spectrum, is an all A Capella group ages 18-29 that holds auditions on August 31. During Pride, Spectrum performed their Turn Back the Dial concert at the Broadway Performance Hall. The concert consisted of music from the 70s and 80s and was the second and final concert of their season. Diverse Harmony also held their first ever summer camp. 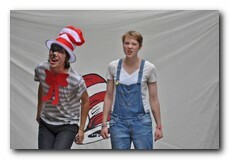 There, the attendees spent a week learning and then performing an abridged version of Seussical the Musical. Diverse Harmony is planning to raise funds in several smaller venues to make the camp an annual event. In October, they are teaming up with the Latino Film Festival. They will also be performing at the Trans Day of Remembrance. In December, Spectrum will have their first concert of the season. In February, their large chorus will be performing a murder mystery concert at Benaroya Hall. With the help of Brown, Bollenbacher and the rest of the Diverse Harmony team plan to continue providing a weekly space where queer and allied youth can express themselves through music and the performing arts. To donate to Diverse Harmony, see their events schedule, or to request an event with them, visit their website at www.DiverseHarmony.org.